Malta voluntarily became a part of the British Empire in 1800 in order to protect the people from military actions between the French and the Maltese during the Napoleonic conquest of Malta. According to the Treaty of Amiens, Britain had to evacuate the islands in 1802, but failed to keep its obligation and this led to the resumption of war between France and Britain. The party elected legislative council was created in Malta in 1849, but home rule was refused till 1921. A long period of instability between the Maltese political elite, Catholic church and British rulers began in the 1930s and Malta eventually was involved into World War II and often bombed by Italy and Germany. In 1947 a constitution under British rule was adopted in Malta. 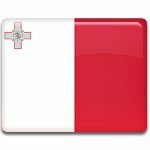 In 1961 a new constitution was adopted, allowing recognition of the state of Malta. On September 21, 1964 Malta became an independent state as a Constitutional Monarchy with Elizabeth II as the head of the state. This day is known in Malta as Jum l-Indipendenza. Parades and festivals are held across the country to celebrate Independence Day. The flag of Malta is displayed on the governmental buildings.